Well, we are fully engulfed in the Hot Stove League and while trades are being made, rumors are heating up and deals are being discussed, many players are spending their time on the cold, sterile table of an operating room. After a grueling 162-game baseball season, it’s no wonder players are left with bumps, bruises and — in some cases — tears in their groin parts. With that in mind, we thought it might be helpful to provide information on these many surgeries, and display them in a more digestible format; that of an image similar to a children’s game most should be familiar with (I won’t say which). 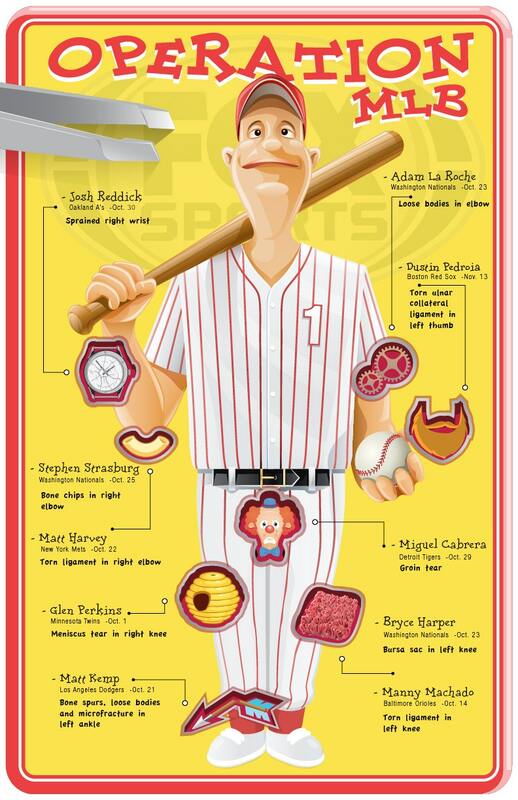 This highly detailed and anatomically correct portrait of your average ball player should aid in our understanding of these injuries as they are typically described in obscure and advanced medical terms like fibrocartilage, loose bodies or elbow. I will be your brave guide, expeditiously walking you through each major operation with the same brevity as the education I received from the Hollywood Upstairs Medical College. The 26-year-old Athletics outfielder sprained his right wrist in August which led to a stint on the 15-day disabled list. Reddick would return to the field in early September and play through the A’s playoff run. Despite being able to play through the injury, he underwent arthroscopic surgery on Oct. 30 and is expected to be fully recovered come spring training in February. After producing maybe the worst season of his career, the 34-year-old first baseman sat out the final three games of the season with a slight bicep strain. On Oct. 23 he underwent surgery to remove loose bodies from his left elbow. Typically, a loose body is a piece of bone or cartilage that floats around in a joint. This may have played a role in his poor season, but it is unclear when he first experienced the discomfort. It was expected that he would resume his offseason workouts in four to six weeks, which by my estimations, should be any day now. He is expected to be ready to go for spring training. The star second baseman tore his ulnar collateral ligament on Opening Day after sliding headfirst into first base in a game against the Yankees. He played the entire season and playoffs and was still able to contribute a .301 average and win a Gold Glove en route to the Red Sox World Series Championship. The thumb, however, required surgery to repair the tear. Fortunately for Pedroia, it did not require the more extensive of the two possible procedures which would have included a graft. The Sox are fully confident that their star will be ready for Opening Day 2014. This one sounds painful … Cabrera had surgery to repair three muscles in his groin that connect to the abdomen on Oct. 29. He suffered the injury late in the season and was hampered by it through the last two months of the season and all throughout the playoffs. Rehab following the surgery was scheduled to last six to eight weeks and he should be ready to go for spring training. Amazingly, Cabrera still managed to win the AL MVP for the second consecutive year — torn groin parts and all. The second player from the Nats to make this list (and not the last), Harper, injured his knee after he ran into the outfield wall during a game against the Dodgers on May 13. He missed the end of May and all of June because of the injury, but eventually returned to the lineup for the rest of the season on July 1. Harper underwent surgery on Oct. 23 to debride and repair the bursa sac in his left knee. Debriding, a common operation to treat bursitis, is the removal of damaged, dead or infected tissue to improve the healing potential of healthy tissue. He was expected to resume offseason workouts four to six weeks after the operation, which should be any day now. Probably the second most significant surgery on this list is the reconstruction of Machado’s torn medial patellofemoral ligament in his left knee. The injury occurred on Sept. 23 in the Orioles’ 156th game of the season. Machado played in all 156 games before he awkwardly stepped on first base and buckled his knee. This type of operation typically requires around six months of recovery time. That would mean that Machado could be healthy right around Opening Day, but realistically he will miss the beginning of the 2014 season. Kemp only played in 73 games this year as he couldn’t seem to stay healthy. His season officially ended after the team’s final regular-season game against the Rockies on Sept. 29, just as the Dodgers were preparing for the playoffs. The star outfielder injured the ankle on July 21 while sliding into home plate and was initially diagnosed with a sprain. In actuality, Kemp had injured a major weight-bearing bone that could potentially become a complete fracture and threaten his career. He underwent arthroscopic surgery on Oct. 21 to remove bone spurs and loose bodies in the joint. Though, more importantly, the procedure included a microfracture of the talus bone, which is a procedure that punches holes in the bone to stimulate the formation of an overlying layer of fibrocartilage. There is no timetable for his return to offseason baseball activities. The Dodgers hope he will be healthy in time for the regular season. The closer had arthroscopic surgery to repair the medial meniscus in his right knee on Oct. 1. Perkins was a first-time All-Star in 2013 and was able to avoid the disabled list for the injury while turning in the best season of his eight-year career. The 30-year-old pitcher racked up 36 saves for a Twins team that only won 66 games all year. According to Twincities.com, Perkins said that the surgery wouldn’t impact his normal offseason routine and that he’ll “be on the racquetball court by mid-November as usual.” Expect him to be back slamming doors by the start of next season. And now for the big one … Harvey enjoyed a breakout year for the Mets before being diagnosed with a partially torn ulnar collateral ligament on Aug. 24. After much deliberation, Harvey and the Mets decided to undergo the operation commonly referred to as Tommy John surgery which would sideline him for approximately one year. It was a sour note to end the season on, but according to Harvey himself, he is way ahead of schedule. Mets fans can expect his filthy stuff back on the mound for the 2015 season. 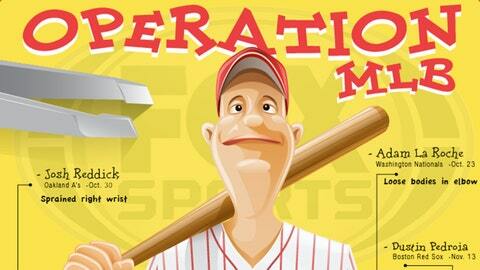 No stranger to operations, the Nationals star pitcher had Tommy John surgery performed on his right arm in 2010. This time, he underwent a much less invasive procedure as he had bone chips removed from his right elbow on Oct. 23. He is expected to be ready for spring training and will return to his offseason throwing program four to six weeks from the operation date. Well, that’s all the notable surgeries happening in OR’s near you. Let’s hope we see all these players out on the field for Opening Day 2014.